Bangladesh’s High Court has temporarily overturned a ban on books published by the minority Ahmadiyya movement. About 100,000 members of the movement live in Bangladesh. The ban was imposed in January by the religious affairs ministry following protests by Islamic groups who want the Ahmadiyyas to be declared non-Muslims. The Ahmadiyyas, also called Kadiyanis, do not believe Mohammed was necessarily the last prophet, which many mainstream Muslims regard as blasphemous. The legal challenge was launched by human rights groups in Bangladesh, as well as a member of the Ahmadiyya community. They argued that the ban on books was a denial of basic human rights. The court issued an interim order suspending it, pending a full hearing that is expected next month. The Ahmadiyya movement, which claims 200 million members worldwide, was founded in the 19th century in what is now Pakistan. The High Court yesterday stayed the government ban on Ahmadiyya publications and proscribed any gazette notification on it until the regular bench of the High Court returns from winter vacation on January 2. The High Court’s (HC) vacation bench of Justice ABM Khairul Haque issued the order responding to a writ petition by six civil society groups and a member of Ahmadiyya Muslim Jamaat, Bangladesh (AMJB). The writ filed on Monday by Dr Kamal Hossain on behalf of Odhikar, Sammilito Samajik Andolon, Ain o Salish Kendra, Karmojibi Nari, Jatiyo Ainjibi Parishad and Nijera Kori and AK Rezaul Karim, an AMJB member, challenged the ban and sought a rule on it. The same day the court fixed yesterday for hearing on the matter. Meanwhile, anti-Ahmadiyya campaigner International Khatme Nabuwat Movement Bangladesh (IKNMB) yesterday announced that they would lay siege to Ahmadiyya Complex on Bakshibazar on December 23 next year. In protest at the HC order, IKNMB brought out a procession from Rahim Metal Mosque in Tejgaon after the Asr prayers yesterday. While marching towards Ahmadiyya Mosque in Nakhalpara they chanted slogans demanding government move to declare the sect non-Muslims. Police intercepted the procession at Nabisco Crossing. The government, on January 8, banned Ahmadiyya publications in the face of agitation by religious bigots spearheaded by some leaders of Islamic Oikya Jote, a constituent of ruling BNP-led alliance. The attorney general did not turn up to the court yesterday although Deputy Attorney General (DAG) Helal Uddin Mollah on Monday told the court that Attorney General Hassan Ariff would make submission on the matter. Dr Kamal Hossain, Dr M Zahir and Barrister Tanjib-ul Alam moved for the petitioners while the DAG for the state. Meanwhile, the court turned down Advocate ABM Nurul Islam’s plea to appoint him amicus curiae (somebody who assists court). The petitioners asked the court to issue a rule on the home secretary, senior assistant secretary of home ministry, inspector general of police and deputy controller of Bangladesh Press to reply as to why the ban would not be declared illegal and stay the operation of the ban order. The High Court Tuesday stayed for 12 days operation of the January 8 government order imposing ban on the publications of Islamic books by Ahmadiya Muslim Jamaat Bangladesh. Vacation bench of Justice ABM Khairul Huq passed the order after a brief hearing upon a writ filed by AK Rezaul Karim, a member of Ahmadiya Muslim Jamaat and six other human right groups challenging the legality of the government order. Eleven months ago the government had proscribed all books and booklets on Islam published by the Ahmadiya Muslim Jamaat that included Bangla translation of the holy Quran. 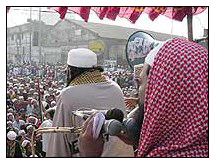 The action was taken in the face of agitation by militant religious groups that demanded the Ahmadiyas, which they call them Qadiani, be declared non-Muslim. The government in its order said certain “objectionable” views contained in the publications have or might hurt the religious sentiments of the majority population of the country. Dr Kamal Hossain appeared for the petitioners. Justice ABM Khairul Huq of the Vacation Bench of the High Court Division of the Supreme Court yesterday stayed the order of the Government banning some publications of the Ahmadiya Muslim Jamat, Bangladesh ( AMJB) till the Court re-opens on January 2, 2005 after winter holidays. The Judge also restrained the Government from publishing the Gazette of the ban till that date. In the face of movement to declare Kadiyanis of Ahmadiya Jamat, as non-Muslims initiated by Anti-Ahmadiya zealots, the Government banned 20 publications ( 10 books and 10 pamphlets) on January 8 last. Challenging the ban, one AK Rezaul Karim, a member of AMJB and six social organisations ; Adhikar, Sammilita Shamnajik Jote, Ain-o-Salish Kendra, Karmajibi Nari, Jatiya Ainjibi Parisad and another filed a writ petition questioning the order as ultra vires of the Constitution. The Court passed the order after issuing Rule upon the Government to show cause as to why the order of forfeiture of the Ahmadiya books should not be declared illegal. The Rule was issued upon the Secretary and the Senior Assistant Secretary of the Home Ministry, the Inspector General of Police and the Deputy Controller of the Bangladesh Government Press. Dr. Kamal Husain filed the petition on Sunday on behalf of the petitioners. He also placed his arguments before the Vacation Bench. A Deputy Attorney-General sought time from the Court on the ground that the Attorney-General would appear and place his submissions in the matter on behalf of the Government. The Court then adjourned the hearing till yesterday but took an undertaking that the Government would not publish any Gazette notification on the forfeiture till yesterday. The Attorney gave verbal assurance to the Court. Yesterday, when the matter was taken up for hearing, the Attorney-General did not turn up. A Senior lawyer ABM Nurul Islam, appearing, on behalf of the respondents, placed two submissions before the Court. He said that the matter was of a great public importance and, therefore, be referred to the Chief Justice to constitute a larger Bench with no less than three Judges to hear the matter. At this the Judge told him that he could make this submission before the Division Bench that would hear the case after the vacation. The Advocate urged upon the Court not to issue any “ stay “ in the matter till it was heard after the vacation by a regular Bench. He argued, if the petitioners did not come up with the writ petition after the impugned order was passed January 8 last why not they wait 10 more days. Dr. Kamal Husain immediately retorted, “If after passing the order banning the books in January last, you took time till today and did not publish the gazette on the impugned order… why not you wait till January 2, 2005 till the regular Bench hears the matter ? ”. The Court then issued the Rule and passed the ‘ stay ’ order. Dr. Kamal Husain and Dr. Zahir with Tanjibul Alam appeared for the petitioners. Deputy Attorney-General Helaluddin Mollah, Assistant Attorney General Giasuddin Mithu and Mohammad Abul Baset stood for the State. All news items are copyrighted to their respective sources.